Last year we had to go to the Royal Easter Show to get a taste of the future of public transport. Back in 2018, the opening of the first stage of Australia’s biggest public transport project – Sydney Metro was still a year off. Now there’s only a month to go before we can all sample what it means to stand at the front of one of those fully automated driverless trains as it speedily glides its way along the first leg of the network – from Chatswood to Rouse Hill in the North West via Macquarie Park. The inner west will still have to wait a little longer. Completion of the SW leg to Bankstown leg via Waterloo and Marrickville is still about 5 years off (2024), while the recently confirmed Metro West to Parramatta doesn’t yet have a firm timeline ( ”mid 2020s” is claimed). 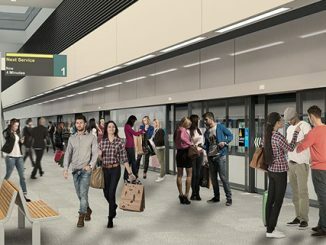 With stations at Bays Precinct, Five Dock, Burwood North and North Strathfield confirmed and trains every 4 minutes at peak times, this is line that will most radically change the way we move around the region. Goodbye 438 and 461 buses (but will anyone miss them?). Though “turn up and go” metro services are familiar to people in other major world cities like London, NY and Paris, Sydneysiders will have have never experienced anything like this before. It will the added advantage over those older systems elsewhere of using completely state-of-the-art technology, a true 21st century public transport system. You wouldn’t know it from reading most of Sydney’s notoriously negative media or listening to the chorus of luddites and naysayers who pop up whenever anything new is planned, but the section opening in May is not only under budget, but will actually be fully operational before its scheduled date. Tunnelling on the SW leg is making fast progress too, with the section from Waterloo to Marrickville already complete – without any of the fuss of the WestConnex tunnels, or, apparently anyone above even noticing. You can check out the dramatic footage of the mega borer nick-named “Nancy” slicing through a wall of rock and arriving at the site of Waterloo station here. Now that the 2019 NSW election is out of the way, there are no longer any obstacles in the way of this mighty transformation in the way we move around the inner west being completed. If there’s anything that will solve urban congestion and curb our over-reliance on fossil-fuel guzzling private vehicles, everyone agrees that fast, modern and efficient public transport plays a key role. It’s less well-known however, that two of the major political parties representing inner west are not totally on board. Although NSW Labor agrees with fast tracking the West Metro, it wanted to scrap the Bankstown line and terminate it at Sydenham. And the Greens, who have sitting MPs in Balmain and Newtown, don’t want to build metros anywhere. Sydney Metro’s facebook page is probably the best place for project updates, but their official website also has a wealth of information explaining this amazing project – including videos and interactive route maps. The future of the inner west is now just 5 years away.